Huummm...they may be wasting their time....depends on who takes control now that Sharon is down. I have sensed a change in direction concerning Isr in the Bush adm the past 8 months...maybe poppa Bush sent some of his old guard to "advise" Jr. to get a grip or risk having his Iraq adventure turn into a huge nuke crater where the ME & Isr use to be. Having no faith in the mentality of the Israeli government. I fully expect them to continue their land grab. Too bad the current Abramhoff scandel isn't bringing down a few Israeli firster Democracts like Hoyer...who is set to give Isr another 1.2 billion on top of their usual 3 billion or so for their Gaza pullout. Oh well, today the GOP Indian scam scandel, tomorrow we can hope for the Donkey's Israeli scam scandel. And now that the fundie jews and the fundie christians are having marital problems we can hope for a big juicy divorce to add fuel to the flame. BTW.....having been out of commission and totally bogged down in another experiment for months, I am behind the curve in up to date info on AIPAC. WASHINGTON — For many years, pro-Israel activists in the nation's capital have had it relatively easy, thanks to the failure of the Palestinians to organize an effective lobby or to station an effective spokesman in the United States. But the fight just got tougher, with the recent appointment of Afif Safieh — one of the sharpest and most eloquent Palestinian representatives in the world — to head the Palestine Liberation Organization's diplomatic mission in Washington. Unlike his predecessor, Hassan Abdul Rahman, Safieh, 55, is an impressive orator and is already assuming a high public profile in Washington. Safieh is an intellectual who, since the early 1970s, has been weaving in and out of academia and diplomatic service for the PLO. 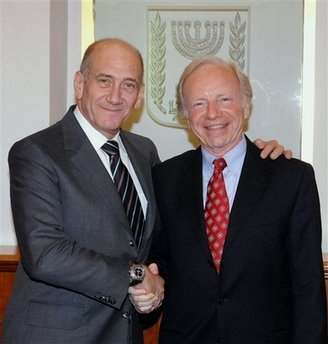 He has held meetings with Bush administration officials and U.S. lawmakers, Arab-American groups, Jewish organizations, think tanks, fellow diplomats and journalists." This guy sounds like both a 'realist" in the ways of politics and not a wall flower when expounding the Palestine view. Maybe he will shake things up a bit for AIPAC. This would be a good time for the gorilla to go back out on some blogs and insert some links to draw discussion. The International Council of Jewish Parliamentarians selected Rep. Gary Ackerman (D.-N.Y.) as its president. The group this week unanimously elected Ackerman, a 12-term member of the U.S. House of Representatives, at the end of a four-day conference in Israel that brought together more than 60 Jewish lawmakers from around the world. Participants also visited the Jerusalem hospital where Israeli Prime Minister Ariel Sharon is being treated after suffering a major stroke. “I am deeply honored by the confidence of my fellow Jewish parliamentarians from around the world and I look forward to building on the great work done by this founding conference in Jerusalem,” Ackerman said. What peace process? oh that's right, you mean kicking jews out of their homes to appease arab terror. gotcha, and here i thought you were crazy. Chief Rabbi's Son Gets Prison.